Port Henry is an historic town with a creative future. We welcome you and hope that you will take a tour of our public art! 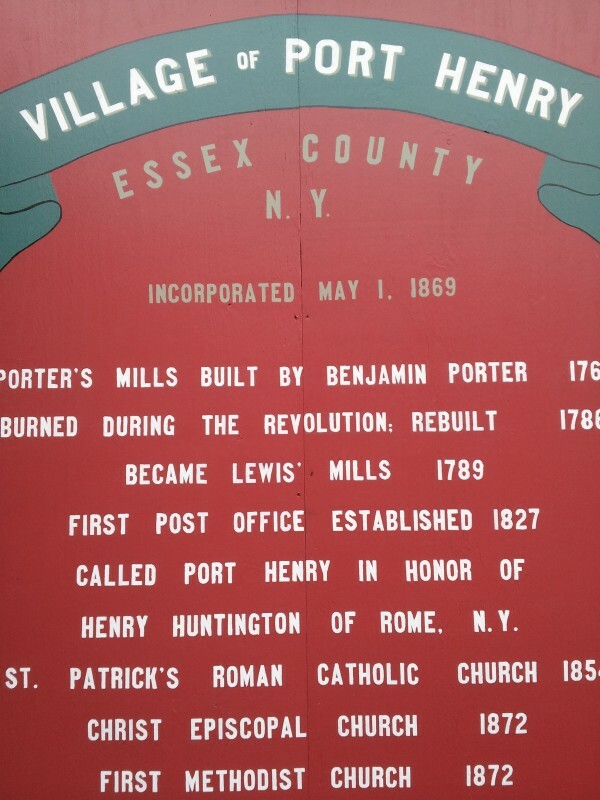 Our citizens create art in many forms...from historic signs restorations to murals and directional signs. Read about it here, or download and print your own copy, and then take the tour and enjoy! And read this, for someone else's perspecive: "Painting the Town" (opens in a new window). Port Henry's downtown park is a hub for village art activities. The Information Booth has an enticing front porch. To the left, there is a large mural depicting the grand Witherbee Sherman Company headquarters that is now the Town Hall. Just to the north, a new mural lists important dates in Port Henry's history. Seasonally (late Autumn), the park hosts "Funky Folk", a collection of wooden folk dressed to express the eclectic range of personalities to be found in Port Henry. 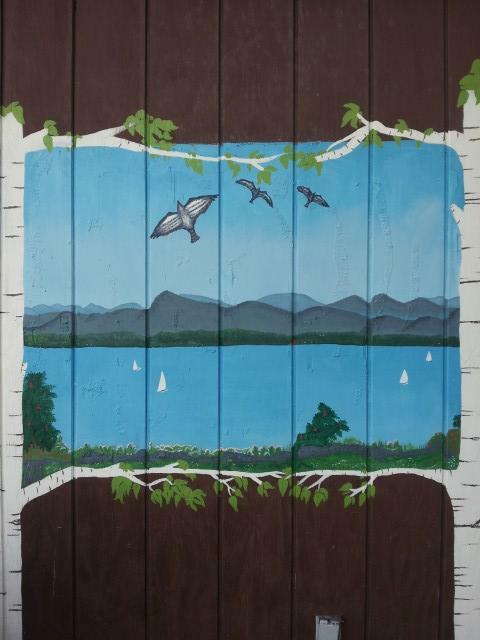 Painted on the side of the Information Booth, this tranquil Lake Champlain view looks eastward from our village towards the Green Mountains of Vermont. 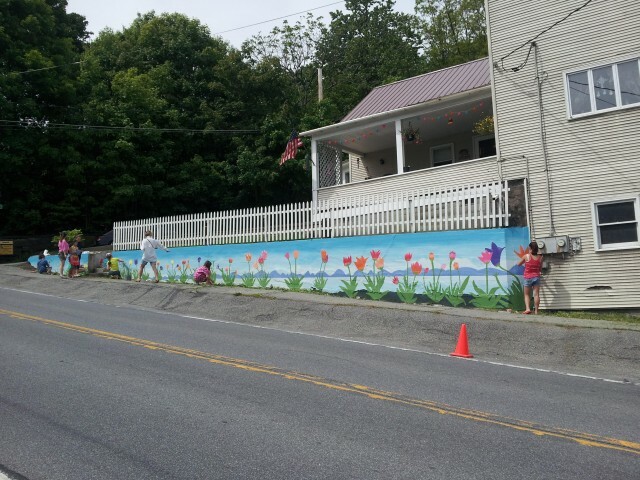 Maria Carufe, the mural's creator, is one of many artists who now live in Port Henry. Just behind the Mt. Moriah Presbyterian Church you will discover a small piece of the Tropics. 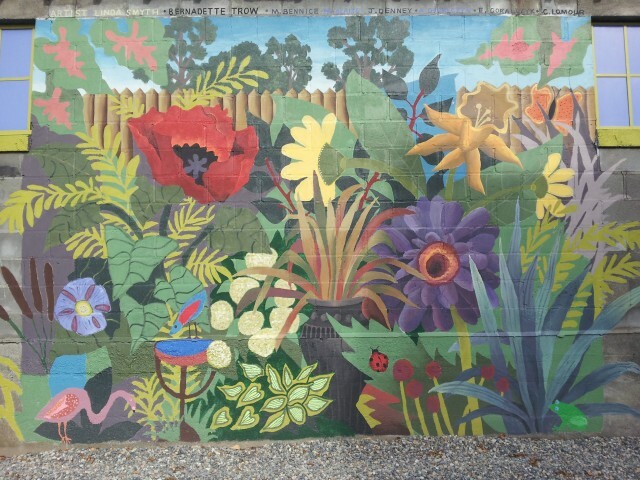 Painted in the summer of 2012, this mural is a jungle of exotic plants and animals including primeval grasses, a ladybug, and a very bright flamingo. See if you can count the number of colors that appear here. Port Henry has one of the most beautiful libraries in Upstate New York. Step inside and you will discover an immense vaulted ceiling that recalls the hull of an old wooden boat. There are paintings of Crown Point, prominent citizens, a marble statue of a young girl, and a fascinating Birdseye view of Port Henry showing many buildings and houses that still stand today. Dating back to around the 1930s, Port Henry artists recently restored this old "ghost sign" for the Bragg Brothers appliance store. Note the wonderful "GE" logo and the art deco style lettering. An artwork in itself, Port Henry's Diner is one of the oldest in the country and one of the few with wheels. Its design was patented in the 1920s and you can see the original patent application drawing inside. Stop in for breakfast or a lunch with a Mexican flair. Local residents recently helped with the historic research into colors and the painting of the exterior. Located on the south entry to Port Henry with a lovely lake view, this new sign honors Johnny Podres who was born in 1932 and grew up in Witherbee, where he learned to play baseball. He was a left-handed pitcher with the Brooklyn and Los Angeles Dodgers. 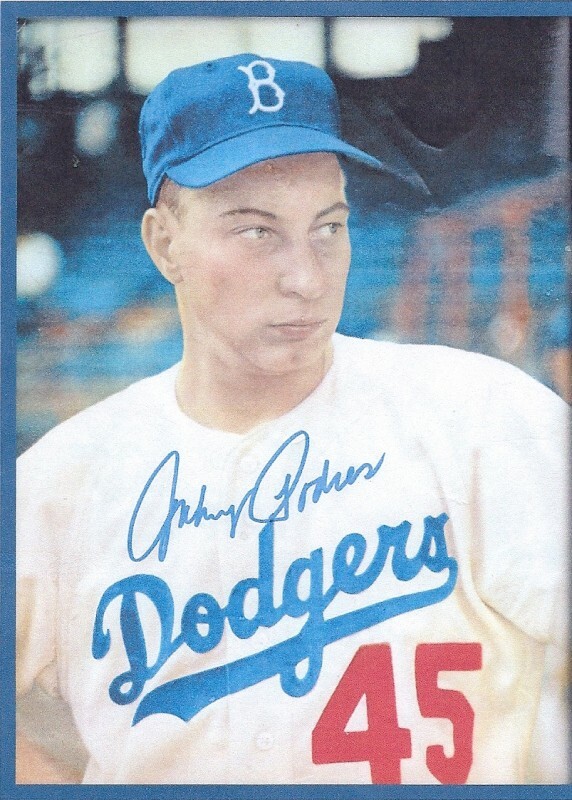 He is best remembered for being named the Most Valuable Player of the 1955 World Series when he pitched a shutout in Game 7 against the New York Yankees. This panoramic mural depicts Port Henry's lakeside location, railroad history and grand architecture. On the left, the famed pitcher and native son, Johnny Podres throws a ball that seems to come right at you. On the right, an iron miner shines his headlamp. This mural, originally displayed on the side of the old Wheelock's Garage, has been relocated to the old Rexall Drug building in Mineville (corner of Plank Rd. and Raymond Wriight Rd.). Placed into the front windows of the former Belden-Edwards Ford Garage, these two grey-scale murals recreate historic photos of downtown Port Henry. The painting on the left shows Main Street looking north circa 1910. 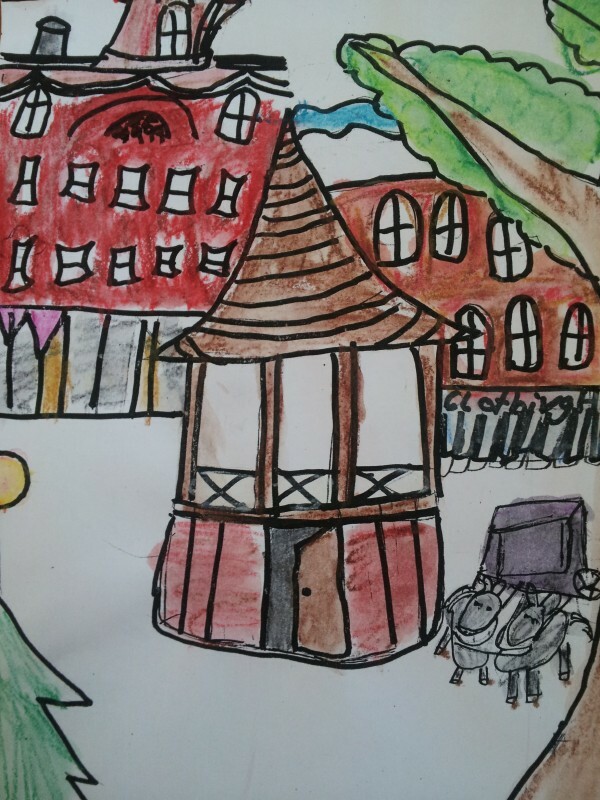 The painting on the right shows the elegant old bandstand and fountain at the center of town. Set in the carriage house of the former Witherbee-Sherman headquarters, this exceptional museum tells the story of Moriah and Port Henry's iron mining history. There are historic artifacts inside and out along with a stunning walk-around model and diorama explaining how the mines operated. Port Henry's artistic talents include stone masonry. Recently, local citizens volunteered to rebuild the circular garden where historically, the downtown bandstand had been located. With superb detail, this new circle garden includes fine stonework and seasonal plantings. 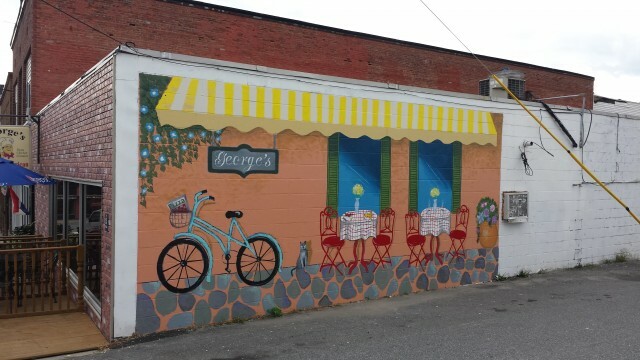 Nearby, on the side of George's Cafe, is a mural designed and created by 12-year old Alethea Goralczyk. 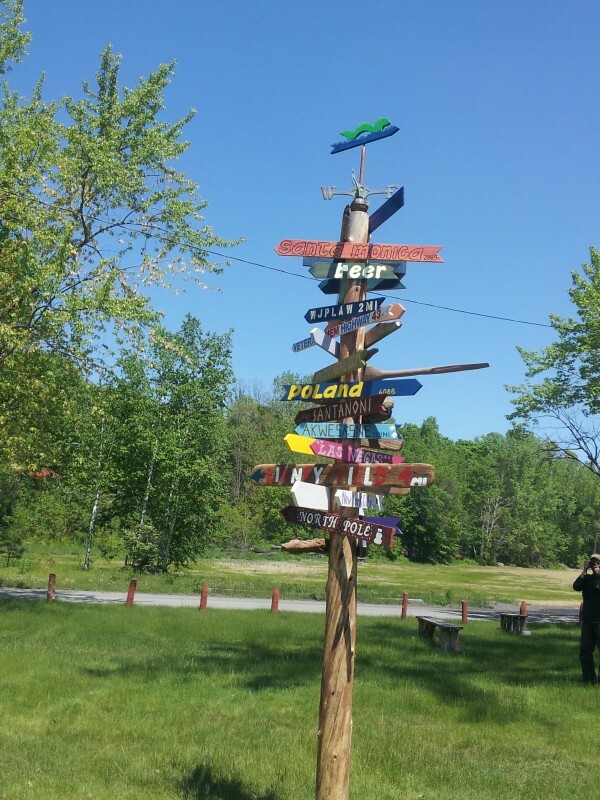 Located at thee entry to Port Henry's Village Beach, this colorful sign has homemade arrows pointing to places around the world and close by. Made of found wood and driftwood from the lakeshore, the sign is sure to get you where you want to go. Previously displayed on power poles leading into downtown Port Henry, the twelve charming banners, with paintings of historic sites, have been retired. Photos of the individual banners, and original essays and stories written by local children, on topics including everything from iron mining to baseball to maritime history, can now be found here. Recently, some of Port Henry's citizen artists created four "window" paintings to adorn the facade of an historic storefront just to the north of the downtown Village Park and fountain. The four wooden panels bring color and flowers to downtown in all seasons. With a balcony and angled shape, the "Catch-Penny" building was a hotel in the 19th century. Seven local young artists painted this festive mural as part of Port Henry "Village of Public Art". Thank you to Louise Celotti for allowing these creative girls, many of whom are her grandchildren, to partake in such a fun project in a very visible location. Hundreds of cars pass daily on Convent Hill. Reminiscent of the days when the arrival of the newest model was "an event", this mural was displayed outside the former Wheelock Garage, on Main Street, south of the village center. Painted by Linda Smyth, latex on canvas. The banner has been removed, for preservation and future display.